In an address before the EU parliament last month, Conference of European Rabbis president Pinchas Goldschmidt said that European Jews feel like they are standing in the middle of a railroad track with trains bearing down on them from both directions. One train is "radical Islam and Islamic terrorism," he said; the other is "the antisemitism of old Europe, the extreme Right." Both "are existential threats" for European Jews, he warned. "Both trains have to be halted before it's too late." Rabbi Goldschmidt's analogy aptly summates why European Jews feel sufficiently threatened to be emigrating in record numbers. The vast majority of rampant anti-Jewish violence on the continent is committed by Muslims, and most of the rest is perpetrated by individuals (and sometimes groups) that can be broadly characterized as right-wing. Anti-Jewish violence in the United States, which "rose dramatically last year" according to the Anti-Defamation League, displays a similar breakdown. The departure of Jews from progressive circles is less a byproduct of militant anti-Zionism than its overriding purpose. But there is third train on an adjoining rail, advancing more slowly. This one isn't producing physical assaults on Jews, or even (in most cases) explicit expressions of antipathy to Jews. However, it is fueling a different kind of Jewish emigration, made all the more disturbing by the fact that it elicits far less public attention and outrage. Militant anti-Zionism first emerged in force in the West in the late 1960s, fueled by the growing popularity of far-left ideologies, hostility to allies of America, and Israel's sweeping military victory in 1967. In an era when open expressions of hostility to Jews had become taboo, antisemitism – a unique Western prejudice two millennia in the making, with a remarkable ability to find expression across the political spectrum – surely helped swell the chorus of voices rejecting Israel's right to exist as a Jewish state. But a case could be made that it was not the driving force of the movement. No longer. 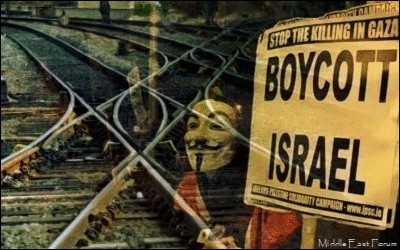 Militant anti-Zionism has become centered around the so-called Boycott, Divestment and Sanctions (BDS) movement, whose singular purpose is introducing defamatory anti-Israel language into the bylaws and resolutions of NGOs, political parties, student groups and other institutions advancing unrelated, mostly leftist or progressive, agendas. Clockwise from left: A 2003 anti-war rally in San Francisco; a 2011 Occupy Wall Street protest in New York City; a 2016 Black Lives Matter protest in Cleveland, Ohio. These hijackings invariably drive large numbers of Jewish activists (and others outraged by antisemitism) out of the host movements, contributing to their decline. 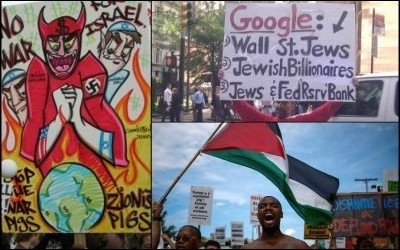 This pattern is most evident in the trajectories of the American anti-war and Occupy Wall Street movements, in the turmoil rocking Britain's Labour Party this spring, and most recently in the firestorm that erupted following the Black Lives Matter movement's adoption of a formal manifesto in August charging Israel with genocide, which led to angry denunciations by its progressive Jewish allies, such as T'ruah and the Jewish Community Relations Council of Greater Boston (JCRC). Of course, sabotaging progressive causes doesn't exactly advance the movement's declared aims. On the contrary, it weakens the very currents in Western society most sympathetic to the Palestinian cause. And while the movement claims it seeks to "pressure Israel" to end its "oppression of Palestinians," its liberal use of Holocaust inversion (claiming Israelis are as bad as Nazis) and tactics glaringly reminiscent of inter-war antisemitism in the West (boycotts, blacklists, etc.) underscore that it isn't really aiming to persuade any Israelis. It's difficult to avoid the conclusion that the departure of Jews from organized progressive causes is less a byproduct of militant anti-Zionist activism today than its overriding purpose. In a recent Tablet article, entitled "Why I Am Finally Raising My Voice Against Jewish Erasure in the Anti-Racism Movement," activist Carly Pildis recounts how merely mentioning her Jewish faith in progressive circles today brings hostile reactions. "I never once brought up Israel to these colleagues, but Israel was discussed at me, angrily, many times," writes Pildis, best known for her efforts to stop the 2011 execution of Troy Davis for killing a police officer. Jewish erasure is perhaps most evident on college campuses. In an October 2 New York Times op-ed, the president of the Brown Coalition for Syria, Benjamin Gladstone, recounts efforts by BDS activists to cut him out of planning for a student demonstration calling for admittance of Syrian refugees because of his high-profile involvement in campus Jewish organizations. He also notes that they circulated a petition against a lecture by transgender rights advocate Janet Mock because it was sponsored by Hillel. They "would rather have no one speak on these issues than allow a Jewish group to participate in that conversation." We will all suffer if progressivism becomes Judenrein. Although a resounding failure in its declared aims, the BDS movement has been increasingly successful in pushing Jews out of organized progressive circles. While few conservatives lose much sleep over turmoil infecting the far Left and liberals continue to balk at calling out "progressive" antisemites, little is being done to combat this trend. Even university administrators, as Winfield Myers warned in The Miami Herald last February, typically object to Israel boycotts only on academic freedom grounds, while tolerating the movement's hate speech. Make no mistake – we will all suffer if progressivism becomes Judenrein, for it will serve to normalize the social exclusion of Jews elsewhere. Surely we have learned by now where that can lead. Gary C. Gambill is a research fellow at the Middle East Forum.